This is the third in a series of GeekLists where I get to spout off about my favorite board games of each year. I've already covered the years of 2001 to 2011. Things started to get a little better in 2012. I took a bit of a step away from board games and started taking some comedy classes. It was a great way to meet some funny people and get perspective on what I enjoyed in life. I also started going to more concerts and shows, started paying attention to my personal appearance, and just trying to enjoy the hell out of things. I still played games with various friends when I could, although I was still looking for a regular group I could enjoy playing with. BGG.CON was, as usual, a huge help, keeping me in touch with all the big Essen games. In 2013, I would finally establish a regular gaming group and fully reclaim my mojo. Keep in mind that only games released between Essen (October) 2011 and September 2012 will qualify for this particular year. So my definition of "year" may not line up with other awards. Last Will is an ingenious game. It's a game of spending money instead of making money. The thing that I adore about it is that one of the best ways to lose money is to buy property. But you can't be bankrupt if you own property, and selling property makes you money, which you don't want to do in this game! So it winds up having this unique feeling of having to dismantle your carefully-assembled engine in order to win. Really cool stuff. The one notable strike against this game is that its theme is quite fluffy and playful, but its gameplay is quite intricate and on the complex side. A lot of players seem to feel ambushed by it; they expect a much lighter game going in than what they get. Still, it's a fantastic game, and one that I'm happy has earned an honorable mention. Belfort is a hybrid worker-placement area-majority game, but it's a whole lot more interesting than that. There's a very tight economy of actions here, and yet always just enough room for you to collect resources to build an interesting building. Little extra details, like Gnome bonuses on buildings, add some spice to the proceedings. I wish endgame scoring was a little more granular. Sometimes, there's nothing particularly interesting you can do at the end of the game. Also, I'm not crazy about the interactive guilds. The game is tight and interactive already without adding player screwage to the mix. It's good for people who really need that extra dose of evil in their game, but not all groups are going to go for it. Still, the game is tuned well-enough that boring endgames are more of an edge case, and nasty guilds are easily removed. This is a really strong game that I'd like to play more of. 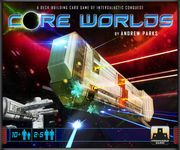 Core Worlds didn't make much of an impression on me when I first played it, but it's since grown on me, and has become one of my top games of 2012. It's a rare deckbuilder that feels very little like Dominion. Instead, it's a game where you have to balance getting cards in your deck versus conquering planets to harvest their energy. 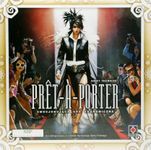 The designer introduced a variant after publication that makes the 4- and 5-player game a little more forgiving. It's also really good with the Phase 0 cards drafted during setup, but tougher to teach. I'd love to get my group more familiar with this game, so we can finally try out the expansion. Ignacy Trzewiczek's economic game set in the fashion industry is a very solid number. It contains lots of planning and a really tight, interesting economy. I've heard a lot of folks complain about this game's theme. For those people, would you prefer yet another city-building game? The fashion industry has all sorts of characteristics that make it a great setting for an economic game: tight margins, fluctuating demand, and lots of competition. I'd love to see more economic games with interesting and unique themes like this. The only gripe against this game is the typical Trzewiczek gripe; its rulebook is not very user-friendly, and is very difficult to learn the game from. If you can get someone to teach you the game, do so; it's worth it. Trajan is a crackerjack design, and has grown to become my favorite Stefan Feld game. The mancala mechanism is ingeniously implemented. After a bit of a learning curve, you figure out how to look a turn or two ahead and try to arrange your pieces and play them in just the right order to hit a cool Trajan tile, or maybe get to play a few turns in a row. That's exactly the thing I love in a game, that a-ha moment when you figure out what your best plan for the next few turns is. This game has it in spades. So, that's it for the 2012 Frantic Ferrets. I'm not giving out an award for Best Family Game this year; I don't think anything met the threshold for this year. Kingdom Builder comes the closest, and I think it's a very good game, but it doesn't hit that element of greatness that makes me want to keep playing it. Of course, that didn't prevent it from winning the Spiel des Jahres, but like I keep saying, the Frantic Ferrets are my awards and no one else's. The Kennerspiel des Jahres and DSP went to Village, which is also firmly in the category of good-but-not-great. I'd happily play it if asked, but there just isn't room in my collection for it. I don't get that feeling of awesomeness that I get from Trajan or Navegador. And there we have it! In the next few days, I will hand out hardware for the current year. Stay tuned!